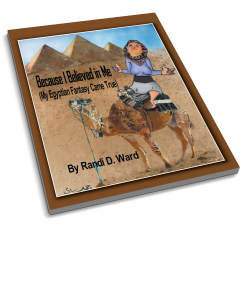 Because I Believed in Me (My Egyptian Fantasy Came True) is a love story of Egypt and Egyptians. An ordinary American woman traveled to Cairo alone to teach and had the greatest adventure of her life. She went there to enable young Egyptians to become more fluent in English, but she became a student again herself. She learned to become an Egyptian woman and to survive successfully in a culture so different from hers. What she learned, experienced, and enjoyed in the Land of the Pharoahs is captured in her own words and emotions. She shares her many exciting adventures, her interesting but sometimes difficult daily life, her incredible teaching experience, and her students and her many friendships formed there plus her new and profound insights and understanding of Islam-once an extremely unfamiliar faith to her-and its true meaning.